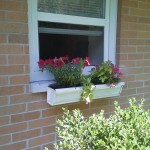 Want a durable, WHITE window box? Ours is made FROM recycled materials and is 100% recyclable. It is guaranteed not to fall apart, rot or fade. 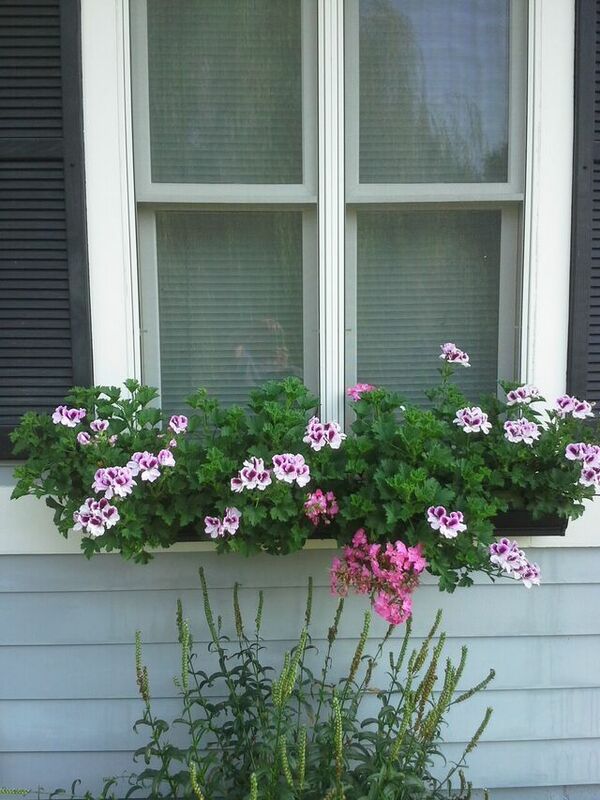 Window Boxes add great curb appeal but fell out of favor because the wooden ones consistently deteriorated. 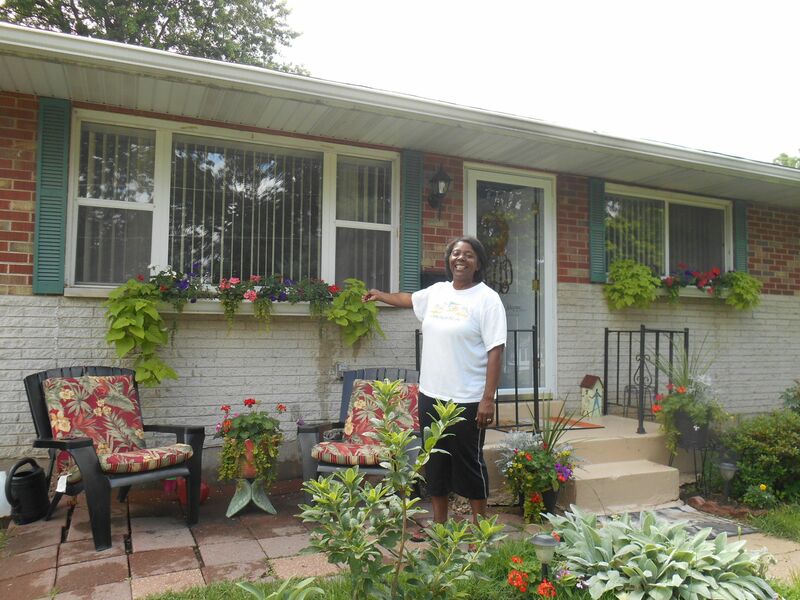 Gutter Gardens are sleek, attractive and because they are made from rain gutter materials, they will never fail you. Hardware is provided for the mounting surface you have…just order the correct mounting hardware when you order them. Concrete or brick installation need tap-cons and all other mounting hardware are Stainless Steel screws/washers. 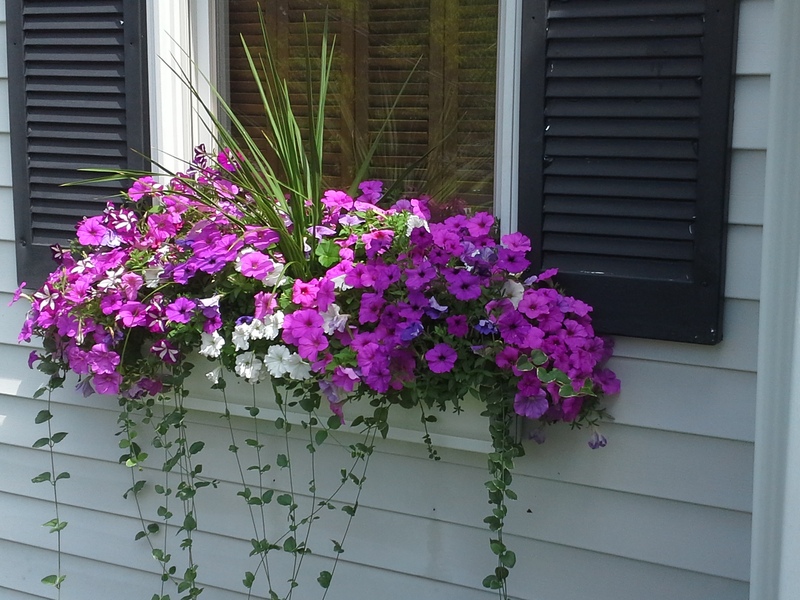 A window box is usually fixed to the wall immediately below it so the owner(s) can easily get to the plants in the container. 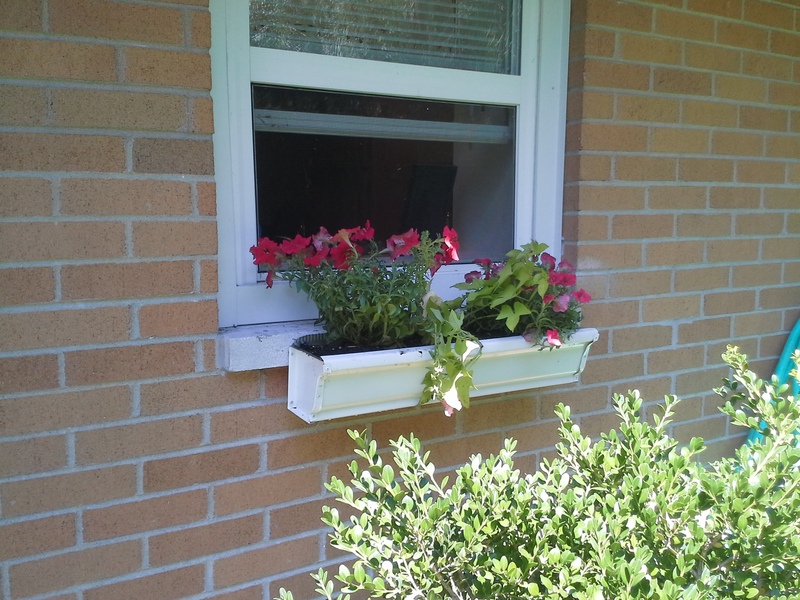 A Gutter Gardens, LLC window box is installed under a window using supplied hardware to suit the wall below. 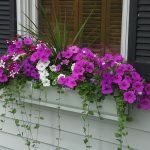 Window boxes are often used by people who live on the upper floors of flats or apartments, and thus do not have access to a garden or patio to grow flowers. Window boxes enable the plants to be readily seen by those inside the property as well as outside.. Access for planting and maintenance can be via the window from indoors. It is also a good way to attract hummingbirds up close and personal! Besides WHITE, these planters also come in BLACK. DARK GREEN and DARK BROWN. Metal (aluminium) material makes this window box lightweight and extremely durable. You’ll love this item for a LONG time! 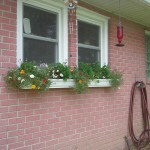 Window Boxes are so popular as we all want to increase curb appeal. Standing up to garden can be done! Using a level, mark the location on the brick sill or concrete wall where you want to mount the Gutter Garden(s) as a raised bed . Take into consideration the amount of sun you will get at that location when selecting plants. Put it in a place where it will be easy for you to water, dead-head and where drainage will not damage items below. Carefully mark where the back holes on the planter are on to the surface where you want to hang them. 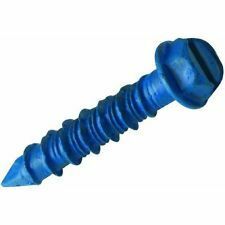 The enclosed tap-cons are the only really adequate screws to use on concrete or brick walls. Two end holes are the most important and need the longer ( 1 ¾”) tap-con screws. The other, shorter screws ( 1 ¼ “) can be spaced every 8-10 inches. Ideally another person is useful to hold the planter in place when making markings for the holes…or you may want to use tape or some kind of strap. Measure twice and drill once. I often slightly begin drilling holes so I can see that they are lining up with each other while remaining level. The planter itself will cover any miss-drilled holes! Drill ‘pilot holes’ using the special masonry drill bit with a hammer drill to complete this task. Before I bought my own, I would rent one and the drill bits are generally available at the rental place. Drill the holes at least ¼ inch deeper than length of the screw itself. Use a can of compressed air (the kind w/ the red straw that lets you blow off dust from electronics) to blow out the concrete dust. It is very important that the hole is drilled longer than the screw you are using…so perhaps make a mark on that red straw to be sure the holes are deep enough. Accurately drilling the holes is the most tedious part, but once the holes are lined up and the screws are tightly in, they will never come out! Use the tap-cons included with your purchase for a very secure raised bed gardens. You’ll receive enough tap-cons and washers to secure your planter/ window box to any type of masonry or brick. Window boxes on Brick need these screws and a washer. Enclosed are brackets to install with planters longer than 36 inches while you are putting in the screws. Hook it on to the front edge and placing the screw into the back hole of the bracket and then into the pre-drilled hole in the concrete surface. The brackets should be approx. 20-22 inches from each end. These brackets will help keep the integrity of the shape because when the planter is full of wet soil, it may tend to splay/bulge. Brick house. Mortar sill. Happy person! 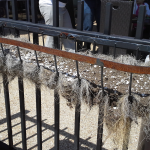 Each foot length of planter requires approx. 3 quarts of POTTING MIX for a 6” wide planter and over 6 quarts per foot for the 8” wide Gutter Gardens. Do not use topsoil or garden soil. Put in about two inches of good quality potting mix (the best ones already have moisture control and plant food). Level it and water it thoroughly. Add another 2 inches and repeat…being sure that the soil is fairly saturated. If you are going to install an existing plant, now may be the time to begin to plant them. You can insert potting mix up to bottom of the back holes. Consider leaving a little room and put pre-moistened mulch around the plants to help keep the moisture in. If you are growing from seed, follow the directions on the packet. If planting seed, be sure the planter is completely full of potting mix (up to the bottom of the back holes) that has been completely saturated…this will give you a level start and provide maximum room for root growth. Use a spout watering can to direct the water where it needs to go. For a 6” wide planter, select the small six-pack of plants…up to a 4” nursery pot. For an 8” wide planter, you may select up to a 6” nursery pot. Go ahead and crowd them together. They are annuals and will find a way to survive the entire season! After about 2 months, begin using water soluble plant food each time you water. If, after a hard rain, the raised bed planter looks like a swamp, take a pin or needle and punch up from the bottom holes. Sometimes the fine soil materials clog the drainage holes. Detailed directions come with your purchase! 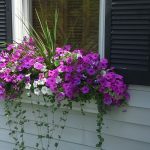 Window boxes have been around for a long time and although they are hugely popular in Europe, they are gaining popularity in the United States. 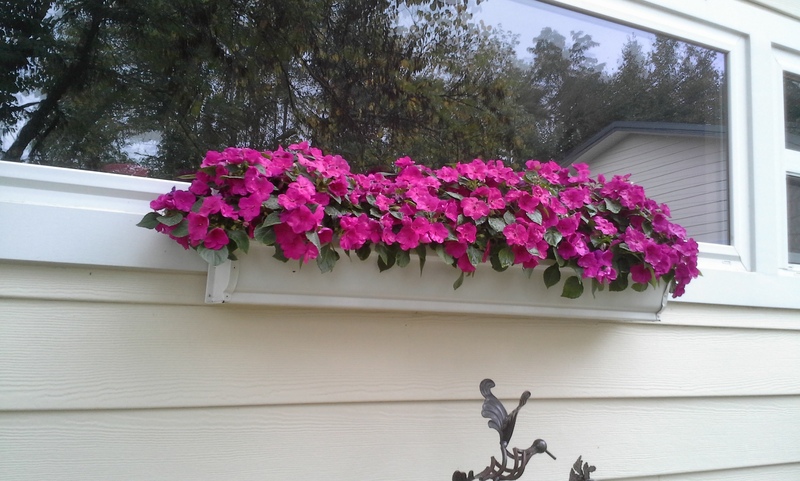 A window box adds color in the middle of an exterior wall by allowing home owners to plant flowers and vines in key locations on any side of the house. Window Box on fiber-cement board house. 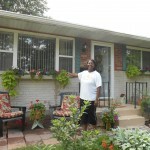 #1 Reason We Make Gutter Gardens! 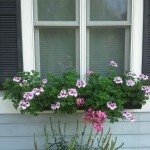 Gutter Gardens™ has researched and experimented with various prototypes and found what we believe to be a smart solution for those inquiring about the possible use of window boxes. We use a deeper/wider-than-normal channel of aluminum rain gutter material that is securely attached below the window. 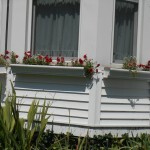 What types of surface is necessary for a window box? The sill…or bottom of an outdoor window can be made of brick, mortar, and various siding materials covering a wood frame. Window box on bay window aluminum sided house. Any of these surfaces is a good candidate for hanging a window box. When ordering, just select the appropriate screws (tap-cons or stainless steel screws) available for the surface you have to work with. 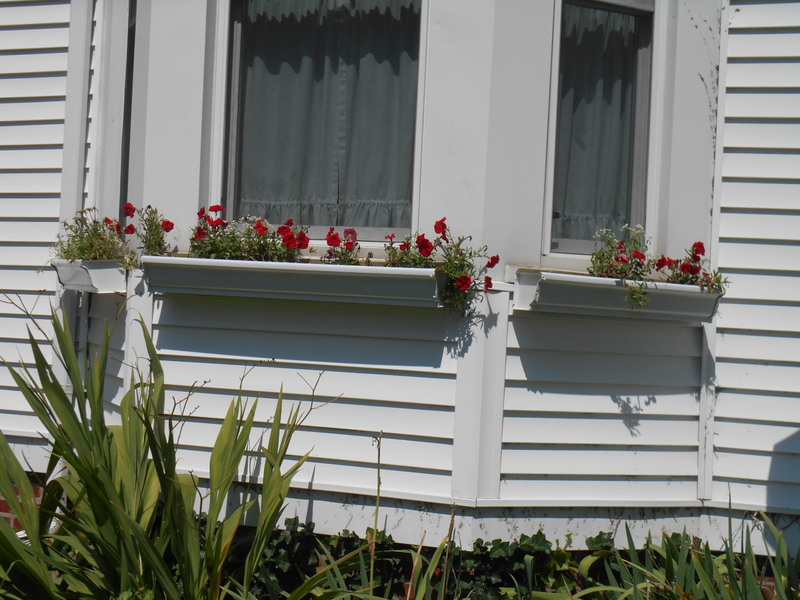 Historically, window boxes have been made out of wood and over time, the material deteriorates and falls apart. Some window boxes have a plastic or vinyl planting box inside which prolongs the life of a wooden window box…but since the planter box must have drainage for healthy plants, eventually all wood window boxes will fail. What are the best Window Boxes? 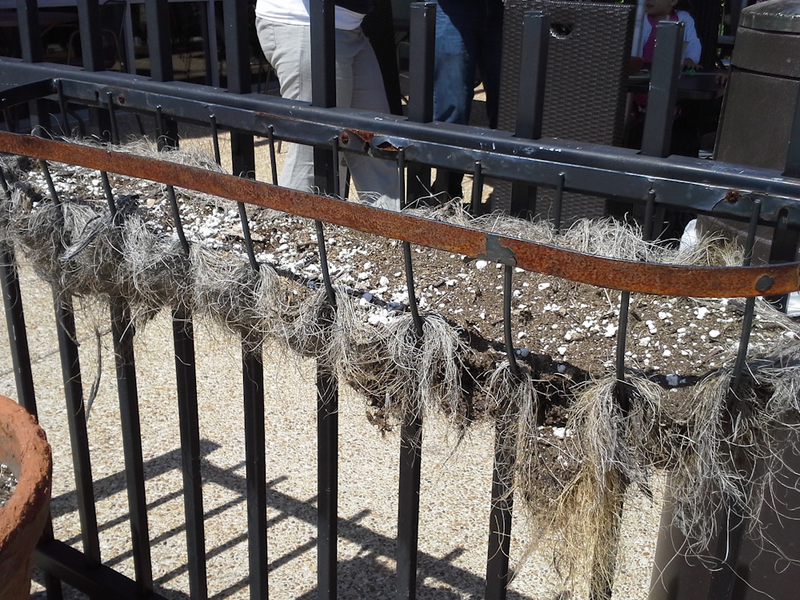 Another popular window-box is made of wrought iron with an insert of coco-fiber (see above photo). This method begins well, but because it is so porous, this window box requires very frequent watering. The fiber lining must be replaced every season….and, because the birds often help themselves to the material for nests, they generally begin to spill their contents around mid-to-end of July. Nothing uglier than a coco-fiber planter that is ignored! 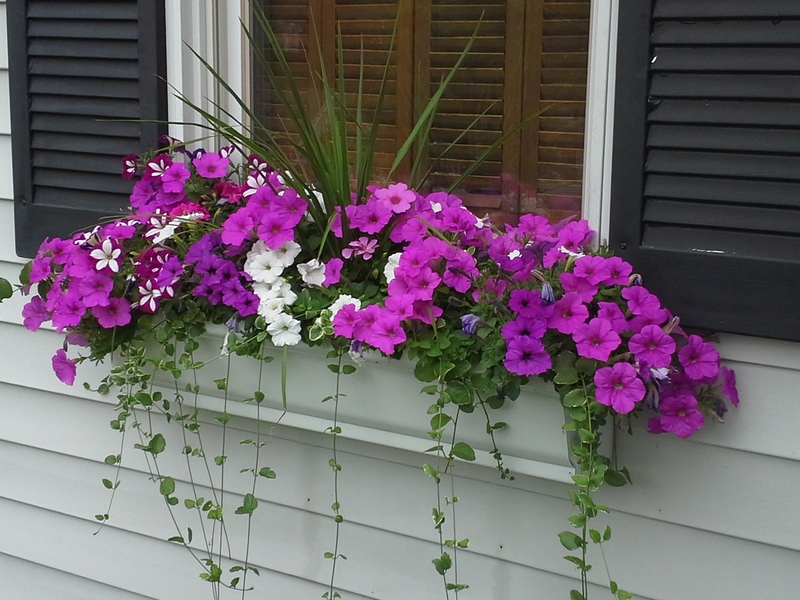 There are some very attractive poly window boxes available on-line now-a-days. Some are treated and will last longer than others because they have been treated to delay the effects of sun UV rays…which will eventually cause the material to become brittle. 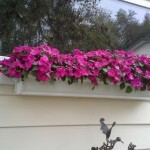 These are generally 3 or 4 times more expensive than the Gutter Gardens™ Window Boxes we offer (in 4 different colors)…which are made from recycled aluminum (and can be recycled somewhere down the line) and won’t last as long as a rain gutter planter. Because they are non-porous, Gutter Gardens™ require less watering and the filtered drainage holes guarantee healthy, gorgeous flowers! We suggest that you select the 8” wide Window box planters because the larger window boxes give your building a larger, more elegant presence, hold more flowers and need less watering than the 6” wide window-boxes. 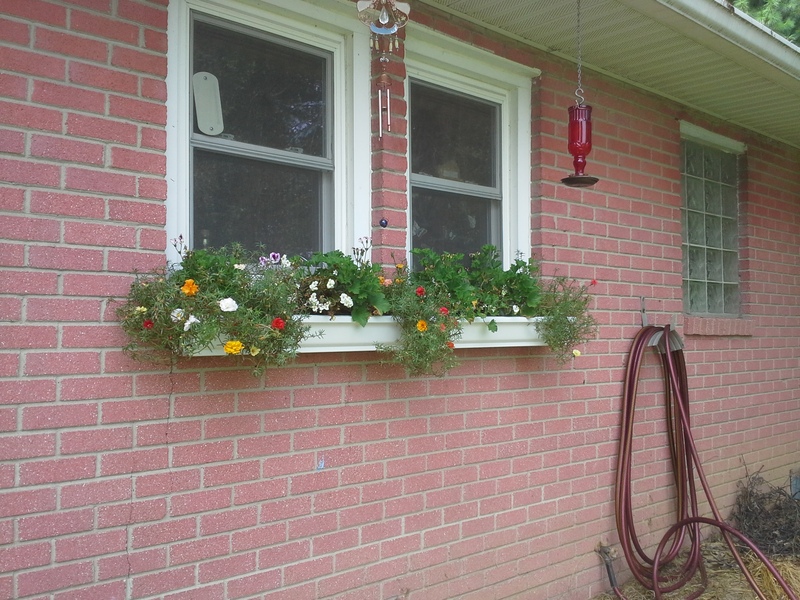 I, the owner and developer of Gutter Gardens™, LLC started out w/ the 6”wide window boxes for 3 years…but switched over to the 8” wide this season b/c I wanted more of a statement and less maintenance and the 8” require less watering. Both sizes worked well and looked great…but the overhang prevented any rain at all from reaching the plants. The 8-inch wide required less watering for this very busy gardener. Be sure to order the appropriate hardware for drilling into concrete/mortar (tap-cons) or wood surfaces (stainless steel screws). Your purchase includes enough screws for the length of the planter you purchase. However, additional hardware items can be purchased from our store and will be shipped with your order.